At the initiative of the West and Central African Council for Agricultural Research and Development (CORAF / WECARD), a training workshop for private and public sector stakeholders on the implementation of the electronic seed platform is being held The hotel Ivotel (Plateau, Abidjan). Opened by the Director of Plant Production and Food Security, Brédoumy Soumaïla, in his capacity as representative of the Ivorian Minister of Agriculture, the five-day workshop aims to equip these actors so that they appropriate and animate the Electronic platform on seeds. According to the emissary of Minister Coulibaly Mamadou Sangafowa, three essential elements are to be retained. 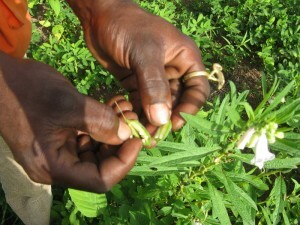 First, West Africa has real potential for seed production with only 12% share satisfied. Second, a policy at the regional and country levels is put in place to improve this. Third, in the seed sector, an evaluation found that only a few countries have an adequate information system. This workshop is therefore timely, he believes, to create a regional community and strengthen the flow of information on the issue in the subregion. In addition, it will have to strengthen the knowledge and practical skills of the actors, to facilitate the trade of seeds, explained Bredoumy Soumaïla, assuring that the Ivorian government will play its score for the success of the company. On behalf of Dr. Harold Roy-Macauley, Executive Director of CORAF / WECARD, Yacouba Diallo pointed out that the regular supply of good quality seed to producers remains one of the major challenges facing agriculture in Africa, West and Central where the current 12% utilization rate is one of the lowest in the world. “Therefore, in response to this challenge of increasing certified seed volumes and their widespread use, CORAF / WECARD has given prominence to its Strategic Plan (2007-2016), the first Plan Operation (2008-2013) has just been completed, and the second one (2014-2018) is being validated, “he said. He took this opportunity to express his gratitude to the technical and financial partners of the project, including ECOWAS, the World Bank, USAID and the National Coordinator of the West African Agricultural Productivity Program (WAAPP) , Dr Angiman Ackah Pierre, also Executive Director of the Interprofessional Fund for Agricultural Research and Advisory (FIRCA). The latter, in his welcome to the participants in the Ivory Coast, urged them “to take advantage of this workshop, which will bring fruit for all aspects of seed acti- vities in the country”. The workshop brings together 47 participants from 13 countries implementing the WAAPP, which includes the seven Seed Program of West Africa (WASP), including 39 from ECOWAS, three representatives from the Executive Secretariat of CORAF, one from ECOWAS and one from UEMOA.